Because speech, mastication, and expression of moods and emotions are based on the ability to move facial musculature—be it voluntary or involuntary—successful treatment of facial nerve paralysis is a vital concern. This article informs the reader about the extracranial etiology of facial nerve paralysis and its current reconstructive options. The diagram below presents a treatment algorithm for facial nerve paralysis according to facial region involvement. 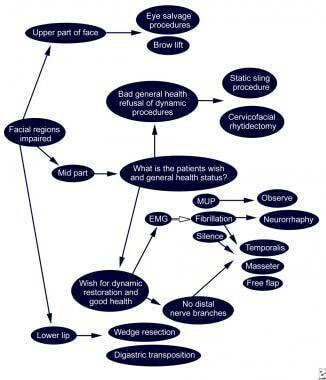 Treatment algorithm according to facial region involvement. The facial nerve (cranial nerve VII) carries motor, secretory, and afferent fibers from the anterior two thirds of the tongue. It originates in the facial nucleus, which is located at the caudal pontine area. Corticobulbar fibers from the precentral gyrus (frontal lobe) project to the facial nucleus, with most crossing to the contralateral side. As a result, crossed and uncrossed fibers are found in the nucleus. In terms of topography, the facial and intermedius nerves course from the posterior pontine area ventrally, passing through the facial canal together with the vestibulocochlear nerve. All 3 nerves are surrounded by pia mater through their subarachnoid course, with the pia mater thus becoming a common sheath at the internal auditory canal. The inferior anterior cerebellar artery and venous drainage enter the auditory canal together with the facial nerve. 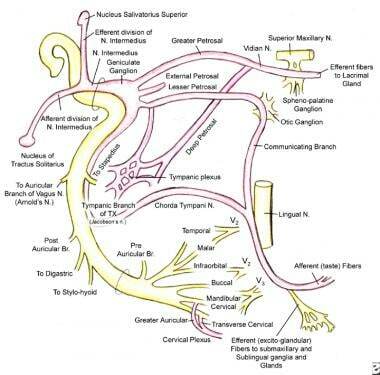 Intratemporally, the facial and vestibular cochlear nerves split, entering the fallopian canal of the temporal bone. Topographically, the further course of the facial nerve is subdivided in 3 segments. The labyrinthine segment, measuring approximately 4mm, extends perpendicular to the temporal bone axis. Initially, the facial nerve runs anterior obliquely, remaining separate from the intermedius nerve and unifying at the next level, the geniculate ganglion. Afferent fibers from the anterior two thirds of the tongue enter the geniculate ganglion with the chorda tympani, as the greater and lesser petrosal nerve emerge from the superior part. The tympanic segment of the fallopian canal extends approximately 1cm. Here, the facial nerve runs horizontally at the medial wall of the cavum tympani. The third, or mastoidal, segment extends directly vertical approximately 1.5cm. The stylomastoid branch of the posterior auricular artery provides vascular supply to the facial nerve during its intrafallopian course. The bony canal-facial nerve diameter is an important clinical ratio, especially considering susceptibility to nerve injury. Most often, the facial nerve takes up approximately 25-50% of the canal diameter. The facial nerve exits the fallopian canal through the stylomastoid foramen, afterward taking its extratemporal course anteriorly, inferiorly, and laterally. The posterior auricular nerve (innervating postauricular and occipital muscles) branches posteriorly cranial just below the foramen, as do 2 smaller ones to the stylohyoideus and posterior belly of the digastric muscle. The facial nerve runs laterally to the styloid process. The facial nerve then enters the parotid gland between the stylohyoid and digastric muscle. The nerve gives off branches lateral to the external jugular vein, constituting the zygomatic-temporal and the cervicofacial trunks. A diverse number of classifications of the extratemporal course of the facial nerve are found in literature. One was proposed in 1956 by Davis et al, who investigated the different course patterns of the infratemporal facial nerve in 350 cervicofacial halves. The buccal division gives off fibers to innervate the buccinator and superior part of the orbicularis oris muscle. The cervical division provides platysma innervation. A "facial danger zone" is known to follow an imaginary line drawn from the lateral canthus to the lateral corner of the mouth and from the zygomatic arch down to the angle of the mandible. The plastic surgeon should keep in mind that the more distal the injury to the facial nerve, the better the chances for spontaneous recovery. Generally, good reconstructive results for facial nerve repair were reportedly yielded by Terzis et al even when a comparatively small number of axons were regenerated. Terzis found a higher nerve-to-muscle fiber ratio than in other skeletal muscles (1:8, compared with 1:50 in other skeletal muscles). Facial nerve injury can be complete or partial. Generally, partial disruption of axonoplasmal flow reveals a greater chance of complete functional recovery. Loss of motor function can be observed immediately after facial nerve injury. Depending on the affected trunk and localization (proximal or distal), various patterns of motor function loss can be seen and used for primary diagnosis of the lesion site. Significant muscle fiber decay has been demonstrated when denervation has been present for more than 3 years. Early changes at the cellular level (approximately 1wk after denervation) include chromatin changes and increased mitochondria number, deoxyribonucleic acid (DNA), and satellite cells, thus reflecting the plastic state of denervated muscle. In addition to clinical and histopathologic findings, it may also be found that parasympathetic functions such as salivation, lacrimation, and taste sensation are impaired. Bacterial infection also may lead to facial nerve paralysis, most often correlated to acute otitis media or externa. Slow-onset facial nerve palsy is observed in patients with cholesteatoma. Iatrogenic injury to the facial nerve most often is seen after cervicofacial rhytidectomies, surgery of the parotid gland, acoustic neuroma resection, or tumor resection at any point along the course of the facial nerve. Therefore, when facial paralysis occurs after surgery, operative exploration must follow if uncertainty exists concerning the intactness of the facial nerve. Due to topographic relations and/or tumor extension, the facial nerve occasionally must be sacrificed voluntarily as part of sound oncologic management. The causes of facial nerve palsy are summarized in Table 1, below. The investigators also found that women received higher scores and had an earlier onset of muscle function than men, younger patients had better results than older patients, and patients with a developmental cause of facial nerve paralysis had a better outcome than did patients with posttraumatic facial nerve paralysis. Intraoperative ischemia was not found to correlate with onset of muscle function. Concerning outcome and donor muscle selection, patients in the study with pectoralis minor muscle transplants were found to have an earlier onset of muscle function than did those with gracilis transfers. Overall, free tissue transfer to the face can be considered a safe and efficient method for the restoration of facial muscle movement. Clinical diagnosis is based on 3 steps: (1) identification of the affected site, (2) underlying etiology (trauma, infectious, neoplastic), and (3) clinical staging (eg, with use of the House-Brackmann scale). Careful delineation of the history should include onset of symptoms, an evaluation of the quality of associated symptoms, and prior infections and systemic diseases (eg, herpes simplex virus, varicella-zoster virus, neoplasms). A thorough head and neck examination is paramount, with occasional use of tests for salivation, tearing, and taste; these are the first steps in determining the site of injury. Physical examination findings reveal affected facial musculature movement. During the patient's initial consultation, evaluate general muscle status (latissimus muscle, rectus abdominis muscle) for eventual reconstruction. House and Brackmann staged injury from grade 1-6, with different chances of spontaneous recovery. These stages correspond with the pathologic findings of neurapraxia, axonotmesis, neurotmesis, and partial and complete transection of the facial nerve. A clinical House-Brackmann grade 1 injury refers to neurapraxia, which is the most likely stage for spontaneous recovery. Axonotmesis is the term for longer compression of the nerve, clinically a House-Brackmann level 2-3 injury, with temporary axonoplasmal flow interruption and subsequent Wallerian anterograde degeneration. Degeneration in axonotmesis is most often incomplete, with more or fewer axons surviving. Thus, partial facial weakness often results. Neurotmesis is a state of permanent loss of axons further characterized by (partial) demyelinization leading to moderate to severe facial musculature dysfunction. Regenerative impulses may end in facial synkinetic movements, mass movements, or contracture. Finally, clinical findings in House-Brackmann stage 5 and 6 injuries (partial or complete transection of the facial nerve) are either the retaining of minimal facial musculature movements or complete loss of function (grade 6). Electrophysiology can be useful to determine the extent of nerve disruption, possible outcome, and treatment options. Most frequently, the minimal and maximal stimulation test (MST) and electroneuronography (ENog) are used. These tests are performed with percutaneous stimulation of the facial nerve. Histopathologic changes in the injured facial nerve include those in the distal part of the transected facial nerve and those found in the proximal part of the facial nerve. The distal stump undergoes Wallerian degeneration or anterograde degeneration: Schwann cells reveal massive proliferation, thus taking on a phagocytic role and removing myelin and axonal debris. Moreover, Schwann cells release certain growth factors that lead the regenerating axons to the distal stump. The basal lamina of the distal stumps' Schwann cells provides scaffolding for the regenerating axonal growth cone from the proximal part of the facial nerve. However, when the distance between the 2 nerve stumps is too great, anterograde degeneration of the distal stump overweighs and finally results in its decay. Several histopathologic findings can be attributed to the regenerative activity in the affected facial nerve. A DNA increase at the cellular level is observed, and regenerating nerve fibers build filopodia, which in its whole volume forms the axonal growth cone. These axonal growth cones advance with motile elements to the distal stump, guided by the proliferating Schwann cell scaffold formed by the distal stump. For suspected intracranial or infratemporal injury, always perform a Schirmer test of tearing to assess lacrimal gland function. Testing with different aromatic agents is needed to determine the integrity of afferent impulses from the anterior two thirds of the tongue. After these dynamic facial reanimation procedures (active motion restoration), balancing and adjustment procedures are performed to give the face the final desired symmetry. These operations are static procedures, thus providing the face with more symmetry and balance at rest. Because of different patient opinions on further operations, these finishing steps should be made following mainly the patients' own desires of symmetry. Examples of these ancillary "touch-up" procedures are operations on the depressor anguli oris muscle group, enhancement of the nasolabial fold, and static eye procedures, such as upper eye lifting, static sling placement, and partial cervicofacial rhytidectomy. May et al used thermocouple placement about the anastomosis site. However, these techniques are not available in all centers and require a second operation to remove the implanted devices. If tension-free coaptation cannot be performed, consider the use of an interposition nerve graft. The great auricular nerve often can be used. This nerve is harvested using an incision made in an imaginary line drawn from the mandibular angle posterior to the mastoid tip. The great auricular nerve mainly provides sensation to the postauricular and the posterolateral cervical area. If, for any reason, the great auricular nerve cannot be harvested or if the length is not sufficient, use the sural nerve as a donor nerve for interposition. The sural nerve supplies the lateral aspect of the calf with sensation and usually is harvested by several small incisions cranial from approximately 1cm posterior to the lateral malleolus. Its major advantage vis-à-vis the great auricular nerve is its length, as up to 35cm can be harvested easily. In conclusion, direct nerve repair using neurorrhaphy techniques yields better results than interposition nerve grafting. Regenerative impulses yield an axonal length gain of approximately 1mm/day; muscle tone and movement is regained approximately 6-9 months after grafting. Clinically, facial nerve paralysis is considered chronic when its onset or the time of injury dates back more than 1 year. Two types of procedures are used in the surgical treatment of chronic facial nerve paralysis: dynamic and static reanimative procedures. Dynamic techniques include all surgical procedures that enable the patient to actively move facial or grafted muscles; static techniques include operations performed to optimize symmetry and reduce complications (eg, lip wedge resection, sling placement, partial cervicofacial rhytidectomy, upper lid blepharoplasty, lateral canthopexy). When considering surgical intervention in chronic facial paralysis, carefully evaluate the patient's remaining potential for spontaneous recovery by electromyography (EMG), MST, and ENog. As indicated in the algorithm in the image below, EMG testing can reveal polyphasic motor unit potentials (MUP), which are expressions of regenerative processes of the facial nerve. Direct coaptation of the proximal and distal facial nerve stumps or interposition nerve grafting should not be performed at this time. In this case, close follow-up study of nerve regeneration with clinical and technical methods (physical examination, Tinel sign, ENog, MST) is the therapeutic strategy of choice. Silence on the EMG usually indicates long-term denervation. In this case, coapting the stumps is not successful, and innervated free tissue transfer or muscle transposition (temporalis, masseter, gracilis muscle) is indicated. The performance of microneurovascular tissue transfer has 2 major advantages in this scenario; ie, the possibility of voluntary facial musculature movement and volume gain in case of loss of muscle volume after surgery. If the patient is not compliant enough to undergo several operative procedures, as is often necessary in microneurovascular tissue transfer or cross-facial nerve grafting, offer static procedures, such as sling placements (temporalis sling, Gore-Tex sling) or cervicofacial rhytidectomies to improve static symmetry of the face. The same decision should be made if the patient is in bad health or at higher risk (eg, diabetes, old age, multimorbid state). In the upper third of the face, a frequent problem is lack of eye closure and ectropic lower eyelid; placement of upper-lid gold weight is performed as a static procedure. For lower-lid ectropion, wedge excision of the lateral lower eyelid and lateral canthopexy are possible static procedures. Cosmetic impairment as found in ptosis of the eyebrow can be corrected with partial forehead and brow lifts. The midthird of the face is probably the most challenging region in facial reanimation. In this area, staple static procedures such as slings (either temporalis sling or Gore-Tex sling) and cervicofacial rhytidectomy, or more complex reconstruction such as tissue transfers or cross-facial reinnervation procedures, can be performed. Base decision making on the patient's personal needs of restoration and, most importantly, on the patients' general health. Moreover, "common" aesthetic procedures, such as partial cervicofacial rhytidectomies, cheiloplasty, and brow lift, can be offered to the patient as ancillary or "touch-up" procedures for the restoration of the paralyzed face. For static procedures, clinical examination is the basis of follow-up care. Closely monitor overcorrection, since gravity and skin laxity should equalize facial hemispheres by approximately 6 months postoperatively. The crossover facial reinnervation technique most often is performed when only the distal stump of the facial nerve is viable. Traditionally, the hypoglossal nerve has been used as the donor. However, the patient may experience swallowing and speech difficulties due to the lack of hypoglossal nerve motor input. For interposition or cross-facial nerve grafts, the Tinel sign can be observed along the course of the regenerating nerve, approximately 1mm/day. Nerve conduction studies also can be used as adjunct studies. A well-known technique is the coaptation of the contralateral buccal branch to the ipsilateral facial nerve, a procedure that is termed VII-VII transfer. This technique requires 2 operations. Primarily, a sural nerve graft is coapted to the contralateral buccal branch, then tunneled through the upper lip and usually left in the subcutaneous tissue. This is performed to allow axonal regeneration in the sural nerve. The temporalis muscle transposition operation can be performed when the distal stump and the corresponding motor end plates are found electrophysiologically not to be viable. Advantage of this procedure is the adjacent volume gain. Elevate a temporofascial flap using a hemi-coronal skin incision. Incise a strip of approximately 2cm and rotate it distally through a preformed subcutaneous tunnel down to the mesiolabial fold. Here, connect the flap to the upper lateral part of the orbicularis oris muscle. Overcorrection is of the utmost importance because of possible postoperative tissue laxity. Harvest the gracilis muscle using a groin-to-middle thigh incision running medially to the tibia. After identification of the gracilis muscle, separate the adductor longus muscle. The vascular pedicle usually is found when the adductor muscle is retracted laterally. Then make an incision on the superior part of the gracilis muscle as needed for reconstruction of the recipient site. Thereafter, transect the vascular pedicle and bring the muscle flap up to the face. After suturing the inferior part of the gracilis muscle, the lateral aspect of the orbicularis oris muscle, pull the superior part cranially, giving until the desired muscle tension is reached, and consecutively suture it to the zygomatic arch. Coapt the donor nerve (anterior obturator nerve) to the recipient proximal stump of the facial nerve or the end of the sural crossover nerve graft. Other donor nerves, such as the ansa hypoglossi or the motor branch of the masseter muscle, also are used. Complications with speech and swallowing must be accepted by the patient; he or she also needs to learn to activate the transferred muscle by clenching the teeth or swallowing. The rectus abdominis muscle free flap can be harvested in a standard fashion as needed, either with or without a skin paddle. Muscle transfer and preparation depend on the needed tissue volume and length. Donor vessels are the inferior epigastric artery and vein. Place the muscle flap in an oblique position and afterward suture it to the lateral aspects of the orbicularis oris muscle and the zygomatic arch, as previously described. Overcorrection is essential in the gracilis muscle free flap and the rectus abdominis muscle free flap. The gracilis muscle flap and the rectus abdominis muscle flap can be harvested with a skin island, thereby providing coverage of even large tissue defects after radical tumor surgery. In microneurovascular transfers, follow-up care involves close monitoring in the hospital with Doppler signals and thorough examination of the flap. Capillary refill and the pinprick test can be used to assess flap viability. As mentioned before, thermocouple devices can be used for free tissue transfer follow-up care, but this technique is available only at some hospitals. The basis of physical rehabilitation is physical therapy. The physical therapist should teach the patient how to innervate the facial muscle efficiently after nerve transfer and grafting. Also, the patient should be encouraged to exercise the facial musculature to gain maximum strength of muscle pull. Nerve stimulation can be used postoperatively; however, electrical stimulation does not constantly demonstrate evident improvements. Gordin E, Lee TS, Ducic Y, Arnaoutakis D. Facial nerve trauma: evaluation and considerations in management. Craniomaxillofac Trauma Reconstr. 2015 Mar. 8 (1):1-13. [Medline]. [Full Text]. Carpenter MB, Sutin J. Human Neuroanatomy. 7th ed. Baltimore: Lippincott Williams & Wilkins; 1976. Harker LA, McCabe BF. Surgical anatomy of the facial nerve. Rubin LR, ed. Reanimation of the Paralyzed Face. St. Louis: CV Mosby Co; 1977. Rouviere H. Delmas A, ed. Anatomie Humaine. 10th ed. Paris: Masson et Cie; 1967. Kehrer A, Engelmann S, Bauer R, et al. The nerve supply of zygomaticus major: Variability and distinguishing zygomatic from buccal facial nerve branches. Clin Anat. 2018 May. 31 (4):560-5. [Medline]. Terzis J. Experiences in restoring symmetrical expression. Presented at: American Association of Plastic Surgeons Meeting. Nashville, Tenn: 1987. Bowden RE, Gutmann E. Denervation and reinnervation of human voluntary muscle. Brain. 1944. 67:273. Katusic SK, Beard CM, Wiederholt WC, Bergstralh EJ, Kurland LT. Incidence, clinical features, and prognosis in Bell's palsy, Rochester, Minnesota, 1968-1982. Ann Neurol. 1986 Nov. 20(5):622-7. [Medline]. Warner MJ, Dulebohn SC. Bell Palsy. 2018 Jan. [Medline]. [Full Text]. Somasundara D, Sullivan F. Management of Bell's palsy. Aust Prescr. 2017 Jun. 40 (3):94-7. [Medline]. [Full Text]. Schirm J, Mulkens PS. Bell's palsy and herpes simplex virus. APMIS. 1997 Nov. 105(11):815-23. [Medline]. May M, Klein SR. Differential diagnosis of facial nerve palsy. Otolaryngol Clin North Am. 1991 Jun. 24(3):613-45. [Medline]. Hunt JR. On herpetiform inflammation of the geniculate ganglion: A new syndrome and its complications. Nerve Ment Dis. 1907. 34:73. Murakami S, Hato N, Horiuchi J, et al. [Clinical features and prognosis of facial palsy and hearing loss in patients with Ramsay Hunt syndrome]. Nippon Jibiinkoka Gakkai Kaiho. 1996 Dec. 99(12):1772-9. [Medline]. Dickins JR, Smith JT, Graham SS. Herpes zoster oticus: treatment with intravenous acyclovir. Laryngoscope. 1988 Jul. 98(7):776-9. [Medline]. Niparko JK. The acute facial palsies. Jackler RK, ed. Neurotology. St. Louis: Mosby; 1994. 1311. Clark JR, Carlson RD, Sasaki CT, et al. Facial paralysis in Lyme disease. Laryngoscope. 1985 Nov. 95(11):1341-5. [Medline]. Fisch U, Ruttner J. Pathology of intratemporal tumors involving the facial nerve. Fisch U, ed. Facial Nerve Surgery. Zurich: Kugler/Aesculapius Publishing Co; 1977. 448-56. Jackson CG, Glasscock ME 3rd, Hughes G, Sismanis A. Facial paralysis of neoplastic origin: diagnosis and management. Laryngoscope. 1980 Oct. 90(10 Pt 1):1581-95. [Medline]. Terzis JK, Noah ME. Analysis of 100 cases of free-muscle transplantation for facial paralysis. Plast Reconstr Surg. 1997 Jun. 99(7):1905-21. [Medline]. Salles AG, da Costa EF, Ferreira MC, Remigio AF, Moraes LB, Gemperli R. Epidemiologic Overview of Synkinesis in 353 Patients with Longstanding Facial Paralysis under Treatment with Botulinum Toxin for 11 Years. Plast Reconstr Surg. 2015 Dec. 136 (6):1289-98. [Medline]. House JW, Brackmann DE. Facial nerve grading system. Otolaryngol Head Neck Surg. 1985 Apr. 93(2):146-7. [Medline]. Kumar A, Mafee MF, Mason T. Value of imaging in disorders of the facial nerve. Top Magn Reson Imaging. 2000 Feb. 11(1):38-51. [Medline]. Kondo N, Yamamura Y, Nonaka M. Patients Over 60 Years of Age Have Poor Prognosis in Facial Nerve Decompression Surgery with Preserved Ossicular Chain. J Int Adv Otol. 2018 Apr. 14 (1):77-84. [Medline]. [Full Text]. Kumai Y, Ise M, Miyamaru S, Orita Y. Delayed transmastoid facial nerve decompression surgery in patients with Ramsay-Hunt syndrome presenting with neurophysiologically complete paralysis. Acta Otolaryngol. 2018 May 15. 1-5. [Medline]. Berania I, Awad M, Saliba I, Dufour JJ, Nader ME. Delayed facial nerve decompression for severe refractory cases of Bell's palsy: a 25-year experience. J Otolaryngol Head Neck Surg. 2018 Jan 4. 47 (1):1. [Medline]. [Full Text]. Ruboyianes J, Adour KK, Santos D, et al. The maximal stimulation and facial nerve conduction latency tests: Predicting the outcome of Bell’s palsy. Laryngoscope. 1994. 104(suppl):1-6. Azuma T, Nakamura K, Takahashi M, et al. Electroneurography in the acute stage of facial palsy as a predictive factor for the development of facial synkinesis sequela. Auris Nasus Larynx. 2018 Aug. 45 (4):728-31. [Medline]. Elston JS. The management of blepharospasm and hemifacial spasm. J Neurol. 1992 Jan. 239(1):5-8. [Medline]. Butler DP, Grobbelaar AO. Facial palsy: what can the multidisciplinary team do?. J Multidiscip Healthc. 2017. 10:377-81. [Medline]. [Full Text]. Chuang DC, Lu JC, Chang TN, Laurence VG. Comparison of Functional Results After Cross-Face Nerve Graft-, Spinal Accessory Nerve-, and Masseter Nerve-Innervated Gracilis for Facial Paralysis Reconstruction: The Chang Gung Experience. Ann Plast Surg. 2018 Apr 17. [Medline]. Ferreira MC. Cross-facial nerve grafting. Clin Plast Surg. 1984 Jan. 11(1):211-4. [Medline]. Fasching MC, Van Beek AL. Monitoring muscle viability using evoked M waves. Plast Reconstr Surg. 1985 Feb. 75(2):217-22. [Medline]. May JW, Lukash FN, Gallico GG 3rd, Stirrat CR. Removable thermocouple probe microvascular patency monitor: an experimental and clinical study. Plast Reconstr Surg. 1983 Sep. 72(3):366-79. [Medline]. O'Brien BM, Franklin JD, Morrison WA. Cross-facial nerve grafts and microneurovascular free muscle transfer for long established facial palsy. Br J Plast Surg. 1980 Apr. 33(2):202-15. [Medline]. Mackinnon SE, Dellon AL. Surgery of the Peripheral Nerve. Thieme Medical Publishers; 1988. 396. Millesi H. Nerve suture and grafting to restore the extratemporal facial nerve. Clin Plast Surg. 1979 Jul. 6(3):333-41. [Medline]. Sade J. Facial nerve reconstruction and its prognosis. Ann Otol Rhinol Laryngol. 1975 Sep-Oct. 84(5 Pt 1):695-703. [Medline]. Baker DC, Conley J. Facial nerve grafting: a thirty year retrospective review. Clin Plast Surg. 1979 Jul. 6(3):343-60. [Medline]. Haller JR, Shelton C. Medial antebrachial cutaneous nerve: a new donor graft for repair of facial nerve defects at the skull base. Laryngoscope. 1997 Aug. 107(8):1048-52. [Medline]. Miehlke A, Stennert E. A new concept in management of facial palsy. Am J Otol. 1984 Oct. 5(6):516-9. [Medline]. Shindo M. Management of facial nerve paralysis. Otolaryngol Clin North Am. 1999 Oct. 32(5):945-64. [Medline]. Prasad SC, Laus M, Dandinarasaiah M, et al. Surgical Management of Intrinsic Tumors of the Facial Nerve. Neurosurgery. 2017 Sep 29. [Medline]. Linder TE, Pike VE, Linstrom CJ. Early eyelid rehabilitation in facial nerve paralysis. Laryngoscope. 1996 Sep. 106(9 Pt 1):1115-8. [Medline]. Ellis DA, Miller RB. Rehabilitation of the paralyzed lower lip. J Otolaryngol. 1984 Dec. 13(6):403-5. [Medline]. Glenn MG, Goode RL. Surgical treatment of the "marginal mandibular lip" deformity. Otolaryngol Head Neck Surg. 1987 Nov. 97(5):462-8. [Medline]. Conley J. Cheiloplasty in the treatment of facial paralysis. Laryngoscope. 1986 Feb. 96(2):140-5. [Medline]. Monballiu G. Cross-face nerve grafting in facial paralysis. Acta Chir Belg. 1981 Jan-Feb. 80(1):47-54. [Medline]. May M, Sobol SM, Mester SJ. Hypoglossal-facial nerve interpositional-jump graft for facial reanimation without tongue atrophy. Otolaryngol Head Neck Surg. 1991 Jun. 104(6):818-25. [Medline]. Bae YC, Zuker RM, Manktelow RT, Wade S. A comparison of commissure excursion following gracilis muscle transplantation for facial paralysis using a cross-face nerve graft versus the motor nerve to the masseter nerve. Plast Reconstr Surg. 2006 Jun. 117(7):2407-13. [Medline]. Tanbouzi Husseini S, Kumar DV, De Donato G, et al. Facial reanimation after facial nerve injury using hypoglossal to facial nerve anastomosis: the gruppo otologico experience. Indian J Otolaryngol Head Neck Surg. 2013 Dec. 65(4):305-8. [Medline]. [Full Text]. Manktelow RT. Free muscle transplantation for facial paralysis. Clin Plast Surg. 1984 Jan. 11(1):215-20. [Medline]. Harii K. Refined microneurovascular free muscle transplantation for reanimation of paralyzed face. Microsurgery. 1988. 9(3):169-76. [Medline]. Harii K, Ohmori K, Torii S. Free gracilis muscle transplantation, with microneurovascular anastomoses for the treatment of facial paralysis. A preliminary report. Plast Reconstr Surg. 1976 Feb. 57(2):133-43. [Medline]. Dellon AL, Mackinnon SE. Segmentally innervated latissimus dorsi muscle. Microsurgical transfer for facial reanimation. J Reconstr Microsurg. 1985 Oct. 2(1):7-12. [Medline]. Tobin GR, Schusterman M, Peterson GH, et al. The intramuscular neurovascular anatomy of the latissimus dorsi muscle: the basis for splitting the flap. Plast Reconstr Surg. 1981 May. 67(5):637-41. [Medline]. Terzis JK. Pectoralis minor: a unique muscle for correction of facial palsy. Plast Reconstr Surg. 1989 May. 83(5):767-76. [Medline]. Harrison DH. The pectoralis minor vascularized muscle graft for the treatment of unilateral facial palsy. Plast Reconstr Surg. 1985 Feb. 75(2):206-16. [Medline]. Natghian H, Fransen J, Rozen SM, Rodriguez-Lorenzo A. Qualitative and Quantitative Analysis of Smile Excursion in Facial Reanimation: A Systematic Review and Meta-analysis of 1- versus 2-stage Procedures. Plast Reconstr Surg Glob Open. 2017 Dec. 5 (12):e1621. [Medline].